LOUDER THAN LIFE has announced additional entertainment, Gourmet Man Food highlights, celebrity chefs, and the initial talent lineup for WWE®’s NXT Superstars for the second annual celebration of the region’s culture and cuisine at Champions Park near downtown Louisville October 3 & 4, 2015. The destination festival features a selection of award-winning bourbons, whiskey, spirits, craft beer, and Gourmet Man Food curated personally by festival creator Danny Wimmer, along with a powerful music lineup of rock legends and breaking talent including Rob Zombie, ZZ Top, Godsmack, Shinedown, Lynyrd Skynyrd, Slash featuring Myles Kennedy & The Conspirators, Breaking Benjamin, 3 Doors Down, Bring Me The Horizon, and many more. Bands will perform on four stages, while attendees will enjoy bourbon exhibitions and sampling, along with more than 70 food and beverage vendors that will help celebrate the bourbon culture and culinary heritage of this unique American city. LOUDER THAN LIFE will also feature live, in-ring matches with WWE®’s NXT® Superstars, as well as interactive experiences and art installations such as Big Bully, artist autograph signings at the Monster Energy Hospitality Rig, the Monster Energy viewing area with beverage sampling, The Crazy Dave’s Music Experience, Jack Daniel’s Experience, Jäger World, It’s Miller Time VIP Lounge, Zippo Encore Music Experience and more. 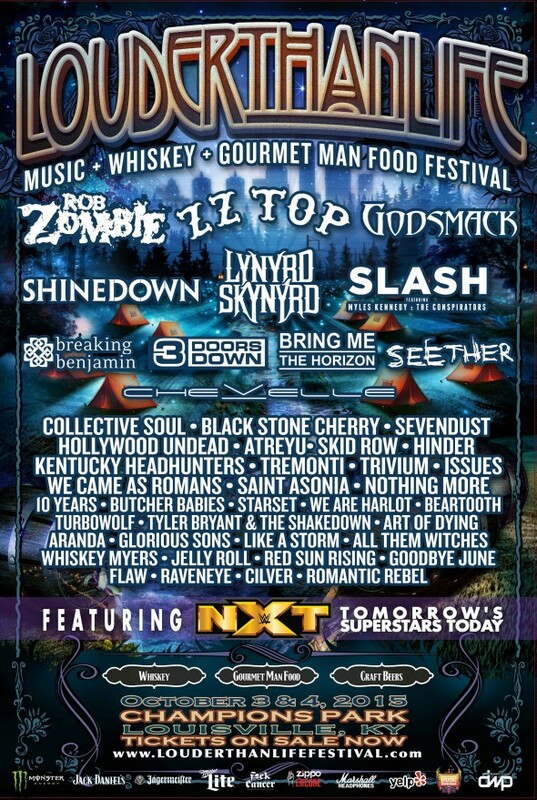 In addition, Trivium, Tyler Bryant & The Shakedown and Flaw have joined the band lineup for LOUDER THAN LIFE. Visit www.LouderThanLifeFestival.com for the full band lineup and to purchase VIP or General Admission tickets. Please see below for more details on the festival’s additional entertainment. Bourbon World presented by The Louisville Courier-Journal: The LOUDER THAN LIFE Bourbon World presented by The Louisville Courier-Journal will include: Angel’s Envy, Basil Hayden’s, Benchmark, Buffalo Trace, Bulleit, Eagle Rare, Evan Williams, Four Roses, Jim Beam, Knob Creek, Maker’s Mark, Michter’s, Old Forester, Town Branch, Wild Turkey, Willett, and Woodford Reserve. Gourmet Man Food Village: The Gourmet Man Food Village will offer selections from Doc Crow’s, Iron Barley, Highway 61 Roadhouse, Momma’s Mustard, Pickles and BBQ, Spotz Gelato, Hi-Five Doughnuts, Art Eatables, Louisville Dessert Truck and many more. Doc Crow’s will be featuring the cuisine of Executive Chef Jonathon Schwartz, including BBQ cheese fries, beef brisket sandwiches, and pulled pork sandwiches. In addition, a joint venture between two St. Louis based restaurants — Food Network star Tom Coghill’s Iron Barley and Bill Kunz’ Highway 61 Roadhouse — will be staging full scale Pig Roast. Craft Beers/Artist Inspired Beverages: LOUDER THAN LIFE will offer regional craft beers and artist inspired beverages such as Alltech Lexington (Kentucky Bourbon Barrel Ale, Kentucky Ale), Falls City Beer (Hipster Repellant IPA, City Pale Ale), Goodwood Brewing Company (Bourbon Barrel Stout, Bourbon Barrel Ale, Louisville Lager), Iron Maiden’s Trooper Beer, Motörhead’s Shiraz Wine, New Albanian Brewing Company (Black & Bluegrass, Hoosier Daddy), West Sixth (West Sixth IPA, Deliberation Amber and Lemongrass American Wheat), and more. Celebrity Chefs: Celebrity chefs at LOUDER THAN LIFE include Tom Coghill (Food Network’s Diners, Drive-Ins, and Dives), who utilizes a power saw to cut ribs for the smoker, and will whip up culinary creations. The Crazy Dave’s Music Experience powered by Musicians Institute: The Crazy Dave’s Music Experience is a free, interactive “rock star” exhibit where fans can get hands-on interaction with tons of musical equipment–much of which is used by their favorite artists performing on stage at the show–and attend meet and greets with members of various LOUDER THAN LIFE artists. Participating brands include ESP, LTD, Fender, Takamine, PRS, Jackson, EVH, Gretsch, Charvel, Fender, Michael Kelly, Chauvet, Earthquaker Devices, Guild, Cordoba, Marshall Amps, Marshall Lifestyle, Guitar Grip, Quik Lok, Yamaha, Epiphone, Kramer, Affliction Clothing, Curve Cameras, Sandisk, and Traveler Guitar. The Crazy Dave’s Music Experience will also feature The Student Experience (TSE) for kids enrolled in music programs in the surrounding areas. TSE features a backstage tour for kids to see the inner workings of a festival and all the jobs the music industry has to offer. TSE also offers intimate time with all the instrument manufacturers before the festival opens. Jäger World and Jägermeister Stage: Jägermeister, the iconic German elixir made from 56 select botanicals, returns for the second year of LOUDER THAN LIFE. This year, the brand is offering band signings in Jäger World, as well as a build your own cocktail experience bar where you can tap your inner mixologist and explore the different nuances of Jägermeister’s complex and balanced flavor. Jägermeister is also presenting the LOUDER THAN LIFE Jägermeister fourth stage, featuring band performances throughout the weekend. It’s Miller Time VIP Lounge: The VIP lounge and sports bar will be showing college and NFL football games all weekend. The VIP area includes: LED screens featuring video feed from all three main stages; VIP dedicated restrooms; upgraded Gourmet Man Food; upgraded bourbon and cocktail selections; shaded VIP pavilion with chairs, tables and couches adjacent to the VIP viewing area (exclusive view of North and South main stages from a seated and standing area located near main stage South). Keep Golf Metal: Patrons can play metal mini golf on our custom 9-hole course, available both days. Entertainment Lockers: Looking for a safe and secure place to store your things while you attend LOUDER THAN LIFE? Personal lockers with unlimited cell charging will be available so patrons can free up their hands and avoid losing any personal items during the fest. Fxck Cancer: Fxck Cancer’s mission is to fight cancer by raising awareness and to educate about early cancer detection, ultimately putting an end to late stage cancer diagnosis. Fxck Cancer sells softgoods and accessories to benefit the FC Cancer Foundation, a 501(c)(3) non-profit organization, which operates the Dyin 2 Live Dreams program. Their mission is to give those who are currently fighting cancer a one of a kind VIP Experience that can be used as a source of inspiration to bring joy and hope to those needing a brighter day in their darkest hour. The Dyin 2 Live Dream VIP Experience starts with one simple question: “If we could make your dream come true, what would it be?” The fulfillment of a dream creates something magical for the cancer victim when they need encouragement and hope the most. Fxck Cancer is dedicated to making every eligible cancer patient’s dream come true. For more info, please visit: www.FxckCancer.org and www.Dyin2Live.org. Help us spread the word by liking us on Facebook at www.facebook.com/FxckCancerUSA and www.facebook.com/Dyin2LiveDreams. Follow us on Instagram and Twitter at, @FxckCancer & @Dyin2LiveDreams. Camping: Camping guests will enjoy a special bourbon-inspired welcome cocktail party on Friday night, as well as have the opportunity to play Knockerball™ in the campground all weekend! Knockerball™ is a single chamber inflatable sphere with inner handles and adjustable shoulder straps. Knockerballs™ range from 1.2 Meters to 1.5 Meters and the size or fit is predicated on your height. Knockerballs™ can be used singularly to perfect your rolls, flips, and wheels. “KnockerBallers” describe the sensation as almost defying gravity. Just imagine the sensation and mobility that a Knockerball™ allows you to experience without putting any stress on the body. Sponsors for LOUDER THAN LIFE include Monster Energy, Jack Daniel’s, Jägermeister, Miller Lite, Fxck Cancer, Zippo Encore, Marshall Headphones, Yelp, The Crazy Dave’s Music Experience, 93.1 The Fox, Alternative Press, TeamRock, Revolver, Loudwire.com, LEO Weekly, The Louisville Courier-Journal, and more. Louder Than Life Official Wrap Up from Danny Wimmer Presents on Vimeo. About Danny Wimmer Presents: Since 1995, Danny Wimmer has created, developed and produced events from the club level to multi-day festivals. Founded in 2007 by industry veteran Wimmer, Danny Wimmer Presents produces some of the largest U.S. festivals in the rock and alternative landscapes. By merging well-known talent with local cuisine and culture, DWP has become recognized within the industry for delivering the highest-quality, exceptional value entertainment experiences to customers, artists, sponsors, partners and host cities alike. Never satisfied with the status quo, DWP strives to create memorable and fulfilling concert experiences leaving both consumers and partners with lasting and meaningful impressions. Over the past six years, DWP has grown — while constantly innovating its production, promotion and fan experiences — from a partner in one single event to producing sold out events across the country, doubling its number of produced events between 2012 and 2013 alone. DWP plans to add as many as five new music festivals in 2016 to its already stellar portfolio, which includes Rock On The Range, Monster Energy AFTERSHOCK Festival, Monster Energy Welcome To Rockville, Monster Energy Carolina Rebellion, and LOUDER THAN LIFE, among others.